The shoulder pain  and socioeconomic burden  that accompany rotator cuff disease are only worsened by the ineffectiveness of the various non-operative treatments (such as rest, physiotherapy, non‐steroidal anti‐inflammatory drugs, and corticosteroid injection) currently available to sufferers . However, fascinating studies in horses have established the safety and beneficial effects (reductions in re‐injury rate) of intratendinous injections of mesenchymal stem cells (MSCs) . This final study prompted the commencement of first-in-human clinical trial, led by Chris H. Jo (Seoul National University College of Medicine, Dongjak-gu, Seoul, Korea), to assess the safety and potential efficacy of intratendinous injection of autologous adipose-tissue-derived MSCs (ASCs) in human patients with rotator cuff disease. In a new STEM CELLS study, Jo et al. report that this MSC-based approach improved shoulder function and relieved pain by promoting the regeneration of the rotator cuff tendon . The safety and tolerability study employed three ASC dose‐escalation cohorts; low- (10 million), mid- (50 million), and high-dose (100 million) groups; and a further group of patients receiving high-dose ASC therapy to assess for efficacy. Encouragingly, while the study reported no adverse events related to the intratendinous injection of ASCs, Shoulder Pain and Disability Index (SPADI) scores decreased by 80% and 77% in the mid‐ and high‐dose groups and shoulder pain decreased by 71% in the high‐dose group. Of note, these scores surpassed the minimal clinically relevant difference for improved shoulder function and reduced shoulder pain. Subsequent magnetic resonance imaging analysis linked ASC therapy-associated decreased shoulder pain to a 90% decrease in rotator cuff defect volume (high dose group), while arthroscopic examinations discovered an 83% and 90% decrease in rotator cuff defect volume in the mid‐ and high‐dose groups, respectively. While the authors note several limitations of their first-in-human clinical trial (related to the weaknesses inherent to early phase clinical trials), the safety and effectiveness observed in this first-in-human trial of ASC therapy for rotator cuff disease should encourage subsequent larger scale clinical trials. Furthermore, the authors hope to add additional histological analyses of tendon tissues and evaluations of adjacent tissues (e.g., rotator cuff muscles, proximal humerus, and articular cartilage of the glenohumeral joint) to further strengthen their already encouraging results. For more on the application of ASC therapy for the treatment of rotator cuff disease and more first-in-human clinical trials for stem cell therapy, stay tuned to the Stem Cells Portal. Urwin M, Symmons D, Allison T, et al., Estimating the burden of musculoskeletal disorders in the community: the comparative prevalence of symptoms at different anatomical sites, and the relation to social deprivation. Ann Rheum Dis 1998;57:649-55. Choi K, Park JH, and Cheong HK, Prevalence of musculoskeletal symptoms related with activities of daily living and contributing factors in Korean adults. J Prev Med Public Health 2013;46:39-49.
van der Windt DA, Koes BW, Boeke AJ, et al., Shoulder disorders in general practice: prognostic indicators of outcome. Br J Gen Pract 1996;46:519-23. Carvalho Ade M, Badial PR, Alvarez LE, et al., Equine tendonitis therapy using mesenchymal stem cells and platelet concentrates: a randomized controlled trial. Stem Cell Res Ther 2013;4:85. 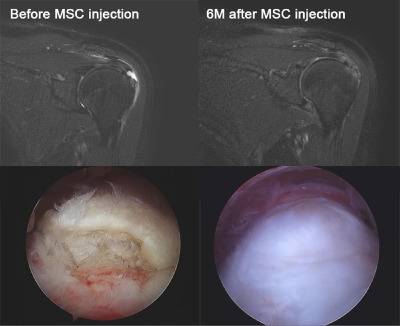 Jo CH, Chai JW, Jeong EC, et al., Intratendinous Injection of Autologous Adipose Tissue-Derived Mesenchymal Stem Cells for the Treatment of Rotator Cuff Disease: A First-In-Human Trial. STEM CELLS 2018;36:1441-1450.